In addition to our standard range of bonding fasteners, we provide purpose-designed custom bonding fasteners for customers who have requirements which cannot be fulfilled from our standard range. For over 12 years Veck Bonding Fasteners have manufactured and distributed high quality, low cost composite bonding fasteners from their standard range of 1500 items, including a broad variety of male and female threaded inserts. All fasteners are offered in Mild Steel or Stainless Steel, with many being available directly from stock on a fast delivery. We operate to ISO 9001:2008 quality management system. 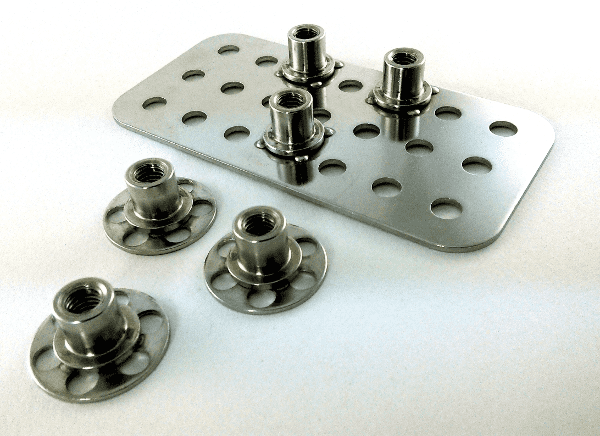 Four different types of fastener in a combination of 10 lengths and 5 diameters are available, all on 7 different sizes of base plate, so it is highly likely that we can meet your requirements from within our standard range. We stock over a million Bonding Fasteners from our standard range alone, with many popular sizes which do not feature in our product list also available. Many customers require special inserts which involve subtle changes or radical variations on our standard products and we design and manufacture innovative composite fasteners to suit these needs. Batches of parts can be held in stock and supplied on a call-off basis, therefore minimising lead times on further deliveries. Veck Fasteners is an ISO 9001 registered company and has been a leading supplier of composite bonding fasteners to many of the key manufacturers in diverse markets, which include automotive, marine and construction, for over 10 years. Drawings and samples of our products are available on request, so please do not hesitate to contact us if you require these for evaluation purposes. Our standard prices are up to 40% less than our competitors and, with additional discounts for larger order quantities, there are many potential cost savings to be made. Please contact us now to discuss your requirements and to confirm price and availability. Stock parts are dispatched immediately and delivered on a next working day basis to account-holding customers in the UK. Delivery to mainland EU countries takes approximately 3 working days and 4 to 5 days to most other parts of the world. I have been dealing with Veck Fasteners for many years. The staff are extremely helpful and polite. The service is excellent, in most cases the delivery would be received the next day. The product range is vast. I have used Veck Fasteners for over a decade and have always received the highest quality products, service and pricing. Their friendly team always helps me source components I need to enhance my own range of fasteners and tools.